District 6 Councilmember Helen Rosenthal at a 2014 Council hearing. Anger over real-estate development and school desegregation on the Upper West Side are fueling what appears to be one of the stiffest challenges faced by a sitting City Councilmember in 2017. In district 6 incumbent Helen Rosenthal is in a rematch with Mel Wymore, a systems engineer and former community board chair, her chief rival in a crowded Democratic primary in 2013. Wymore snared the New York Times endorsement four years ago, but Rosenthal received about 1,300 more votes out of 29,000 cast to win with roughly 27 percent. Wymore announced in March that he was running again, and his bid has received generous press attention, in part because Wymore, a man who gave birth to two children and is the executive director of the transgender-rights advocacy organization TransPac, would be the first transgender Council member. Rosenthal has outraised but also outspent Wymore so far, leaving her with a slim $7,000 advantage in cash-on-hand at last count. A third Democrat, Cary Goodman, is also on the ballot for the September 12 primary. He emphasizes opposition to the American Museum of Natural History’s plan to expand its footprint into Theodore Roosevelt Park, which Goodman says would erase too much open space. Rosenthal has supported that expansion plan, even committing city capital money to it, although she has expressed reservations about some particulars of the plan. The school controversy centered on P.S. 199, a successful school that is majority white and more affluent, and P.S. 191, a nearby school that has struggled with academic and safety issues and is majority Black and Latino and serves many low-income families. P.S. 452, another successful school, was also part of the mapping change Community Education Council 3 (CEC3) considered beginning in 2015. The CEC’s goals were to alleviate crowding at 199 and at 452 and to reduce the socioeconomic skew among all three schools in the hope of improving 191’s performance. One key tool for achieving both aims was the opening of a new school on the West Side, something scheduled for 2018 that Rosenthal says she convinced the de Blasio administration to move up to this coming fall. Another step was to redraw the zone lines, which previously channeled residents of the largely white, middle class Lincoln Towers development to PS 199 and residents of NYCHA’s Amsterdam Houses to PS 191. CEC approved the rezoning by a 9-1 margin in November. According to Kim Watkins, now the president of CEC3, Rosenthal was the only public official to attend all the Council meetings dealing with that plan. She was also the only one to support the CEC’s considering redrawing the lines. Assemblywoman Linda Rosenthal, who is not related to the Councilmember, and State Senator Brad Hoylman attended a rally against it. Comptroller Scott Stringer cheered the Assemblywoman’s efforts. Even Congressman Jerrold Nadler opposed the plan. Councilmember Rosenthal, gesturing to a map of the Lincoln Towers area during a recent interview, said most pols scorned the plan because “Anybody who broke apart the white community here would be voted out of office,” since the Towers generate a hefty chunk of District 6 turnout. Indeed, at one CEC3 meeting, a parent threatened electoral consequences for pols who supported the rezoning, and two petitions opposing the move on Charge.org garnered hundreds of signatures. Get our free Election Watch bulletin today. Rosenthal’s campaign rejects the process critique, insisting that she keeps in close touch with the parents involved in schools throughout the district. Aides say that while she endorsed early on the rationale for changing the lines, she didn’t formally embrace the specifics of the plan until the CEC had made its sentiments clear. Wymore’s campaign believes the school rezoning is just one of several issues where Rosenthal’s actions or alleged apathy have created pockets of resentment. It’s the combination of those dissatisfied factions that drives his challenge, whose energetic nerve center is a headquarters on Broadway that, at least on the day City Limits visited, was teeming with fresh-faced volunteers. The longtime community organizer also faults Rosenthal for failing to advocate strenuously against tall new buildings planned for the area. Council District 6 has seen a substantial amount of recent development; according to the Furman Center, the local community district ranked seventh out of the city’s 59 districts for new residential capacity in 2016. A few buildings have generated deep opposition, like 200 Amsterdam Avenue, which is supposed to rise to a height of 666 feet and be the neighborhood’s tallest building. The objectionable projects were largely “as of right”—jarring because they represented a drastic change from what currently exists on the site, but permitted under the current zoning. Because “as of right” projects typically don’t enter the city’s land-use process, in which the local Councilmember has extensive power, the member has little to no leverage over them. Wymore says that’s what needs to change. Wymore’s campaign also says what is needed is a special permit for the district to require developers planning dramatic increases in density to undergo public review even if they are as of right. Such an approach would be novel, according to sources familiar with City Planning practice, and could encounter legal obstacles. Rosenthal’s campaign says the special permit idea would restrict the city’s ability to create housing to ease the affordability crunch. But Rosenthal has also looked for unorthodox solutions to the supertall scourge on the West Side, suggesting at a Council hearing in June hearing that urban renewal areas should be revived because of the extra leverage they provided against developers. 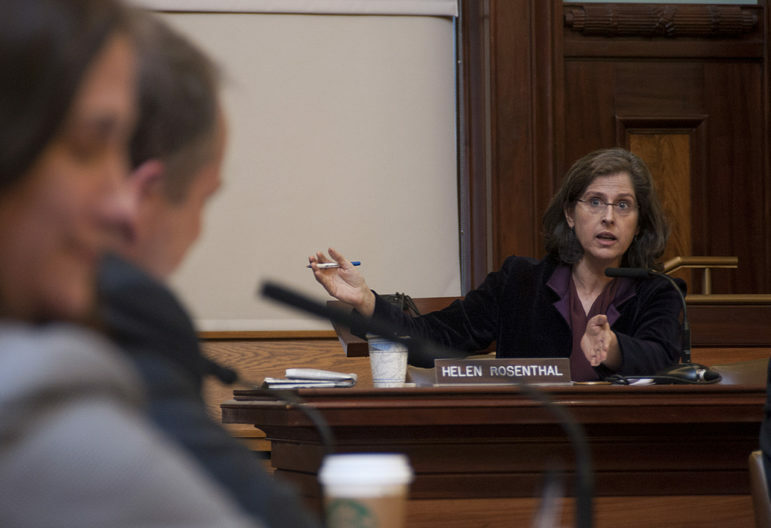 Rosenthal, who was endorsed early by TenantsPAC, has focused on the problem of illegal hotels throughout her term, and did raise questions about two major development projects in the district as early as 2014. More recently, the Councilmember wrote to Extell Development in June voicing concerns about plans for 36-44 West 66th Street site, although that site began causing a stir months earlier, in February. The proposed high-rise at 200 Amsterdam is now undergoing additional city review—a victory for opponents. The Councilwoman and Wymore clashed earlier this year at a rally against the building, with Rosenthal preventing her opponent from speaking. Rosenthal’s campaign says her stance on development has been “responsible,” meaning she has tried to balance concerns about development impact against her general belief that the city needs more housing, especially affordable housing. Hence her advocacy for changes in the de Blasio administration’s mandatory inclusionary housing and Zoning for Quality and Affordability measures, which she ultimately supported. Even as she tries to rebut Wymore’s claim that she’s been asleep at the wheel on overdevelopment, Rosenthal does not emphasize her land-use advocacy when she reviews her time in office. She points instead to her advocacy for traffic safety, including drafting a law that cracked down on dangerous taxi drivers. Rosenthal also takes nerdy pride in her chairmanship of the contracts committee, where her budget analyst skills (she worked the the city’s budget office for most of her adult life) helped her stop a bloated schools contact saved the city an amount somewhere in the nine figures. She’s advocated for the disabled as well. Gender aside, the leading candidates in the race present a personality contrast that, to some degree, each candidate embraces. Rosenthal projects the image of a policy wonk and budget hawk who dishes details and is, she says, “terrible at press.” Wymore, more polished and circumspect in his interview answers, stresses his chops as a political and community organizer. With reporting by members of the City Limits Youth Training Program in Public-Service Journalism: Lianis Fernandez, Terrence Freeman, LaShea Gallop, Valeria Hernandez, Maquan Keith, Jonah Muhammad and Janiya Taylor. Looks like even the diehard white liberals of the UWS want safe schools for their kids. And who could blame them. Make no mistake! Helen Rosenthal’s lame attempt to make herself look like she stood alone against racism IS A FARCE. Outside of politics I’m sure you can count her minority friends on one finger. In her attempt to use the UWS to run for Controller or Public Advocate, she has neglected the neighborhood. Nobody but her campaign really even knew who she was until the rezoning issue. As a parent who attended every single meeting on this, I can also say that Kim Watkins is not being truthful when she says Helen came to all of them. She DID NOT! As is her pattern, Helen Rosenthal takes credit for many things here but has done little or no work to earn the accolades. She has told us over the years that “nothing can be done” about 200 Amsterdam, then swoops in late in the game to attach herself to the delay ruling. As a minority Upper West Sider the rezoning issue is about Math not Melanin. Only 1 out of ten kids can read in that system, yet they took the principal and her failing staff to a new building, forced in the middle class parents who will pay for tutoring and even teachers to make up for the shortcomings that will raise scores and make the CEC3 and the DOE look like they were right. Rosenthal gave both middle fingers to the UWS and Lincoln Towers. In Sept, we will return the favor. You are correct! This long, seemingly detailed article is wrong in several places as it relates to the school zoning, and it misses the key points entirely. The article states PS 452 was overcrowded. It was far from over crowded, in fact it was hoping to grow. PS 452 was first opened only a few years ago to help alleviate the overcrowding at PS 87, which it successfully did! Closing PS 452 on West 77th Street and re-drawing the surrounding zoning lines has lead to a return to over crowding not only at PS 87 but also PS 199, PS 9 and PS 166. Second, the article makes it seem as though the CEC was unitedly in favor of this rezoning and re-siting plan. The truth is that the CEC took an unprecedented and perhaps illegal step by acting outside of its appointed role, which was to vote on any plan presented to it by the DOE. Instead, certain CEC members CREATED the plan, behind closed doors (and in apparent violation of Open Meetings Law – see the published advisory opinion which states so) and without the knowledge of all CEC members (see statements by then member Noah Gotbaum). This was always an issue of elementary school capacity – the DOE had long planned to open a new school in the southern portion of District 3 but the CEC, with Helen’s help, squashed that plan, instead voting to permanently close over 300 seats in the area. Helen and the CEC’s turning of this situation into race relations is disgraceful not only because it is wrong but also because neither Helen nor any single member of the CEC was personally impacted by their plan. How convenient for them. This is Trumpism. Helen should be booted out. When Assembly member Linda Rosenthal, BP Gale Brewer, Comptroller Scott Stringer, and Congress member Nadler are not for a school redistricing plan and CM Helen Rosenthal is perhaps there is something wrong with the plan. Calling your colleagues cowards and your constituents racists is not leadership. It’s one more example of the kind of vindictive politics that Helen Rosenthal practices. She lost Lincoln Towers in the last race and now she is punishing them. Helen just took advantage of a situation. Something she does regularly. I am the only ,candidate in this race with a platform — on development, education, small businesses, gender equity, etc. http://WWW.VOTECARYGOODMAN.COM. Liberals like Samantha bee and her husband were fighting the reasoning. See,s liberal ideas are good for other peoples children not theirs. I wonder what private school her kids will be going to now. There’s no UWS candidate who really stood up for fairness and desegregation in UWS schools. The CEC3 rezoning addressed very little: not how schools became unequal in the first place, not PTA fundraising as a supposedly off-budget source of unequal funding, not the way upper class parents ignore zones to choose their schools anyway. The privileged parents who rolled mob-deep at the rezoning meetings made it seem “radical” to stand up for minimal changes to a school system that’s maximally skewed in their favor. It’s incredible to say that they weren’t consulted. Even the unambitious CEC tried for several years to get them to agree to *something* before voting to rezone. Helen Rosenthal supported the CEC in doing something, however inadequate. It doesn’t make her a hero, but other electeds didn’t even do that much. On another note, I know very little about Mel Wymore himself yet, but his campaign volunteers whom I saw at Pride were straight, white, self-important jerks who were literally shoving children out of their way. I was embarrassed for them and whoever sent them out. That last bit about the Wymore volunteers at pride is a flagrant lie. I was marching with Chuck Schumer’s group directly behind Wymore’s group. They were a good 20 feet at least behind any group in front of them and didn’t touch anyone. Most of then came up to Senator Schumer and were incredibly polite to him. Also of the people to come up to Schumer half of them were white at most, and how you can possibly tell what someone’s sexuality is from looking at them is baffling to me. You are a blatant liar and it’s pathetic. I don’t care very much either way what happens with the election but I don’t get why you would randomly come lie on a comment section. Maybe you are Rosenthal supporter I don’t know but a liar you definitely are. Not particularly a Rosenthal supporter. I was with Wymore’s volunteers on the street after the march and then on the subway with the Pride crowds. Nice that you saw something different, but I didn’t. I identified them as straight based on their behavior and conversation, no guessing involved. And nothing “random” about posting that experience with workers for a candidate who wants to represent me. In the crowded race to represent Soundview and its environs in the City Council, the State Senator faces opponents who are lesser known and far more progressive.